Website Update & new merchandise! I updated the Video Games page with a bit more info and pictures for various games including Gremlins: Gizmo which was recently released by NECA. We also have been getting reports of the new wave of Gremlins toys hitting store shelves, have you seen them yet? comment below and help other fans find them in your area! This wave includes Daffy, George and the Gremlins 2 Flasher Gremlin. Click on the pic to make it bigger! Sorry for the lack of updates, but life has been busy. Game – Board: Here we have the entire board all set up for game play. 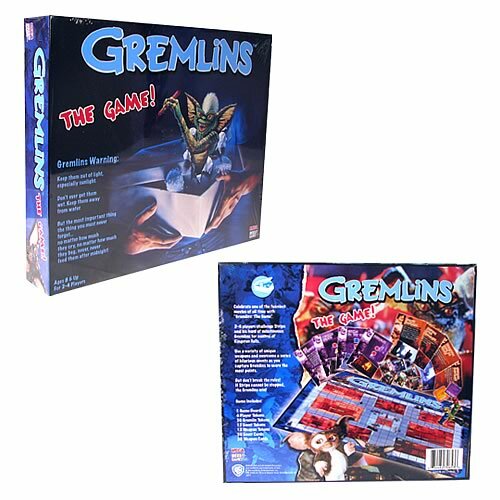 Gremlins Boardgame By NECA Available??! We have gotten quite a few emails on this one over the last week, and after looking into it further, I am hoping to see if this is verified or not. So if anyone has ordered this product, please contact me ASAP, as I would love to have some pictures of the components in the wild. Anyways, the Gremlins Board Game that has been rumored for about 3 years now seems to finally be available for order….